Sawada’s inspiration still comes when he least expects it. “Akiko,” he looks at his wife at his side, “likes kimono a lot, so that gave me the idea to use kimono. Often she gives me some vague idea of the kind of thing she likes. If I think about it for a while, and then it suddenly comes out. Just as we are talking a pattern may spring to live inside me.” The moment that happens Sawada is in a different world and the shapes evolve as by magic. 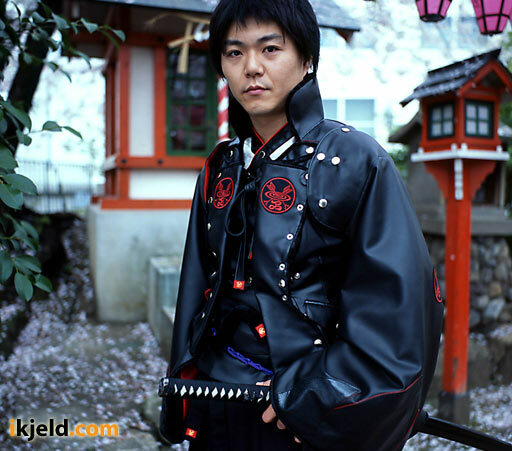 Many of Takuya Angel designs are inspired by clothes that Samurai wore in ancient times. Sawada deliberately uses the Japanese terms: ‘hitatare, haori, hakama, kyahan, geta’. It is quite a departure from the modern Japanese habit to give an English moniker to everything that must appear new. Even if there is a good Japanese word for it. Sawada never makes these ancient clothes exactly as they were. He adapts the shape to the needs of modern life, and uses modern materials whenever possible: cupra, polyester, gabardine, velvet, fake fur. Often he incorporates parts of antique kimono in his clothes. This means that almost every item is different, because it is impossible to find more than one kimono of exactly the same design. He also lets himself be inspired by anime and manga. He is crazy about Japan’s transforming robots and has applied that to his clothes: a t-shirt that can be with sleeves, with half-sleeves or without sleeves; a skirt that can also function as a coat; leg warmers that can also be used as a cape, or as a mini hakama. Sawada calls these designs “one-stone-two-birds-clothes” and they are wonderfully playful. 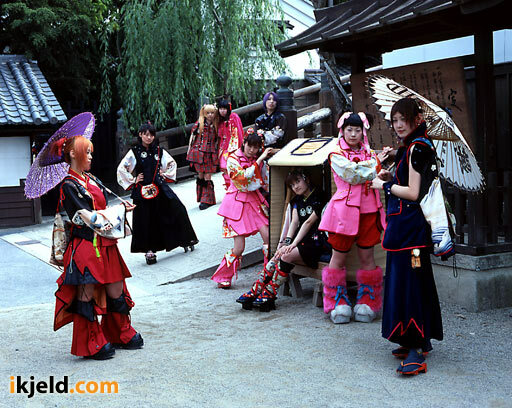 Takuya Angel now consists of two shops with revenues of JPY 30 million a year. It is a tiny brand, but Takuya Angel has an impact that goes far beyond its actual size. If you have seen Sawada’s clothes once you never forget them. The people who wear them, don’t just wear them, they worship them. It brings something alive in them that they didn’t even know existed. “Fashion is like a business card,” explains Sawada. “Just by looking at someone’s clothes you can understand a lot. What kind of work they do, what kind of music they like, what kind of food they eat.” He doesn’t dare to explain what his clothes say about the people who wear them.